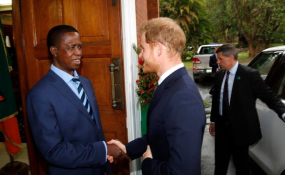 Prince Harry and President Edgar Lungu. In September this year, Elephants Without Borders (EWB) director Dr Mike Chase released a statement about the discovery of 87 elephant carcasses during Botswana's quadrennial census. Forty-eight dead elephants were reportedly found in one day. The case went viral, with journalists, analysts and politicians weighing in to discuss its impact. In a bid to address growing negative publicity, the Botswana government launched its own fact-finding mission to investigate Chase's claims. Local and international journalists were invited to participate. The investigation revealed 19 elephant carcasses, of which six were found to have been killed by poachers, challenging the EWB's figures. What started as a census exercise soon turned into a political numbers game between the government and EWB amid a congregation of media, scientists and international advocacy groups. Botswana has long been lauded for its successful conservation efforts - a status that it now risks losing. Elephant poaching is not new in Botswana. According to Brigadier Simon Barwabatsile, who chairs the country's National Anti-Poaching Committee, an average of 80 elephant are poached in Botswana every year. The northern region, in particular, has become a poaching hotspot due to the prevalence of pachyderms. According to the 2014 great elephant census, Botswana had a total elephant population of 130 451, amounting to 37% of the total savanna elephant population. At the time, the country boasted the lowest percentage of dead elephants observed during the count. It was this combination of having the highest elephant density on the continent, along with a relatively low carcass ratio and poaching incident rate, that led to Botswana's status as an unparalleled conservation success story. Botswana's success has also been attributed to an unofficial and controversial 'shoot-to-kill' approach against poachers, which was seen as acceptable despite not being a policy per se. It was a strategy that was supported by former president Ian Khama. Shortly after President Mokgweetsi Masisi's election, the Department of Wildlife and National Parks anti-poaching units were disarmed on the basis that it was against the law for non-military officials to own military weapons. The 'shoot-to-kill' approach turned out to be as contentious as it was, arguably, effective. Supporters believe that it was a good deterrent and blamed the recent spate of poaching on its removal. For them, militarised anti-poaching strategies are necessary to combat such crimes, and the more firepower, the better. Meanwhile, opponents of the approach welcomed Masisi's decision as a move towards rectifying the human rights abuses that allegedly occurred as a result of the unofficial policy. There have been allegations that rangers disproportionally targeted foreign suspects from surrounding countries, especially from Zimbabwe and Namibia. Scholars have also pointed out that the militarised approach creates an arms race between rangers and poachers, inevitably leading to more violence. Also, such an approach only targets the lowest tier of the illicit wildlife trafficking networks, leaving the upper tiers - such as the buyers, traders and kingpins - largely untouched. Before its recent investigation, the Botswana government attributed some of the elephants' killings to human-wildlife conflict, related to human settlements. In recent years, this has posed an increasing concern for government officials as well as local residents, particularly in the Chobe region. Existing measures such as the use of chili plants, herd dogs, predator-proof kraals and shade-cloth fences have had limited success in deterring wildlife from populated areas. Elephants continue to destroy fences, crops and livestock, impacting on locals' livelihoods and resulting in retaliation against the animals. Consequently local communities have become less supportive of wildlife conservation and are more susceptible to becoming involved in the illegal wildlife economy. Botswana's government provides compensation to affected residents, but this compensation is often described as insufficient. Monetary compensation as a long-term solution is inherently problematic. '[We need to] start thinking of constructive methods of how conservation areas and wildlife could benefit local communities,' advises Dr Annette Hübschle, a senior researcher with the Global Risk Governance programme at the University of Cape Town. The hunting ban imposed in 2014 reportedly had serious consequences on income generation for local communities, and some proponents are fighting to have it revoked. Alternatively, the government could provide different economic opportunities for the residents. The Global Initiative Against Transnational Organized Crime reports that 'instead of investing in a militarised response to poaching', the money should be focused on improving the subsistence of the community. For instance, the benefits accrued from tourism should be used in a way that benefits local communities through the creation of socio-economic opportunities. Placing more boots on the ground alone doesn't appear to be an effective long-term plan. 'A broader strategy,' notes Julian Rademeyer, project leader with the international wildlife trade monitoring network TRAFFIC, 'is one that tackles transnational organised crime networks rather than focusing on taking out poachers on the ground.' Poachers are easily replaceable as the profit generated from illegal trade is quite high, and forms an attractive pull factor. Rademeyer stresses that dismantling these networks requires targeting the mid-level syndicates, i.e. those who provide the financial and logistical support. This can only be achieved through better intelligence gathering and in-depth investigations. The tussle between Chase and the government highlighted important challenges for elephant conservation in Botswana. Coordinated efforts by government and other actors are needed. Until then, the killing of elephants will persist as transnational crime networks continue to exploit the situation. This article was first published by the ENACT project. ENACT is funded by the European Union (EU). The contents of this article are the sole responsibility of the author and can under no circumstances be regarded as reflecting the position of the EU.